Sunday League scorelines. Hapless defenders. Flair players taking the p*ss. Major League Soccer is like the Premier League in the 90s and we absolutely love it. Everyone has got their own favourite era of football, but anyone who doesn’t think the early Premier League years were the best ever is simply wrong. It was just wonderful. But wasn’t it a bit, y’know, sh*t, we hear you twenty-somethings say? Well, yes, sometimes – and that’s exactly why it was so brilliant. Imagine how much fun it’d be if every Premier League club had to replace half their team with players from the Football League. Imagine if Liverpool had Virgil van Dijk in defence with Richard Keogh. Imagine if Manchester City had Steve Morison up front with Sergio Aguero. Well, you’ve basically just imagined the Premier League in the early 90s. Football was great before the Premier League, sure, and there had always been stand-out players even when clubs were buying almost solely from Britain, but when the doors were opened to scores of players from overseas, suddenly football in England became a whole lot more interesting. There is no better example of that weird juxtaposition than the Middlesbrough squad of 1996-97 which contained the world-renowned talents of Juninho, Fabrizio Ravanelli and Emerson but also the rather more rustic beauty of players like Steve Vickers and Robbie Mustoe. And that was at Middlesbrough FFS. It was a similar situation at clubs all over the league. At Sheffield Wednesday, Paolo Di Canio and Benito Carbone played alongside Andy Booth and Jon Newsome. At Chelsea, Gianfranco Zola and Gianluca Vialli joined Steve Clarke and Andy Myers. That’s not to say that any of these were bad players; they just weren’t as good as these players suddenly being signed from top clubs around the world. This is steretyping, of course, but suddenly, instead of marking a big striker who enjoyed a pint, roughhouse centre-backs were having to contend with the movement of Zola, Di Canio and Dennis Bergkamp. And boy did it make for some entertaining viewing. Well, for the nostalgic among us who still love to reminisce about those days, something very similar is happening in MLS. Actually, it’s been going on for a while now so perhaps the period of peak entertainment has passed, but every year a couple more big-name players head to America to take the p*ss. Zlatan has scored 25 goals in 29 games since he joined LA Galaxy. Wayne Rooney has got 16 in 25 for DC United. David Villa and Sebastian Giovinco got 14 and 13 last season. But then Bradley Wright-Phillips got 20. Carlos Vela got 14, and he’s scored six in five already this season. A couple behind him on the top scorers list is Krisztian Nemeth of Liverpool fame. Where else would you see such a weird mismatch of players standing out? OK, similar things are happening in China, but no offence to fans of the CSL, MLS is just an easier league to get interested in. And not just because of the mix of players, either. It just seems like a lot of fun. 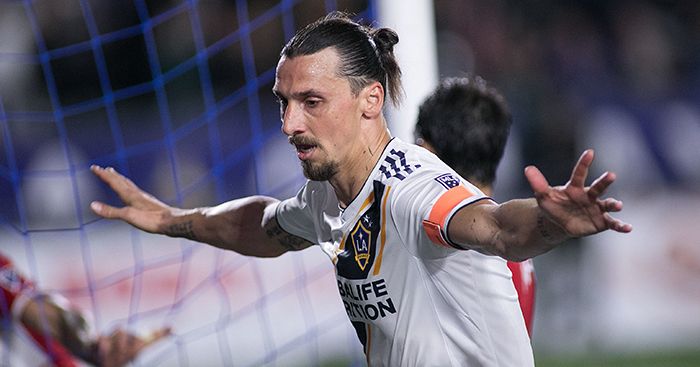 In the most recent round of fixtures, Zlatan scored twice, including a Panenka penalty. Rooney scored with a free-kick from by the corner flag. Sporting Kansas City won a game 7-1. LAFC won 5-0 away from home, and they’ve literally only been playing for a year. How can you not get excited by scorelines like that? We’re not suggesting you give up your European team to go support a club in MLS, but if you insist on having a bit on the side, go for something completely different and have some fun. That’s certainly what the players are doing. That Zlatan Panenka was at 1-1. Would he have risked that at 1-1 for Man Utd? OK, this is Zlatan so maybe, but that kind of panache is everywhere. Alejandro Pozuelo’s goal for Toronto against New York City on the same weekend, for example, was absolutely ridiculous. He didn’t exactly stand out for that kind of thing at Swansea City – do you even remember him being there? – but he did this on his debut in MLS. And he’d already scored a Panenka penalty himself. Then there was Vela’s wondergoal to complete his hat-trick for Los Angeles FC. Who cares what the overall standard is like if we get to see goals like that? That’s not to say it’s just the players from Europe smashing it. Newcastle United broke their transfer record to sign Miguel Almirón from Atalanta United in January, and Bayern Munich forked out nearly £10million for Alphonso Davies when he was still 17. Just like happened in England when players from overseas flooded into the leagues, the homegrown players are upping their game, too. But if it’s one thing that’s really convinced us MLS should be everyone’s second favourite league, it was this from Pedro Santos. It just wouldn’t happen in the Premier League. Everyone’s too bothered about results instead of focusing on the really fun stuff like a bit of keepy-uppy on the run to get past some puddles. It’s great seeing footballers at the top of their games, but entertainment is about more than just that. It needs comedy, it needs people to be enjoying what they’re doing. It needs the people watching to be enjoying it for the spectacle and not just the result. MLS has all that. Give it a go. Can you name every player from the USA to score in the Premier League?